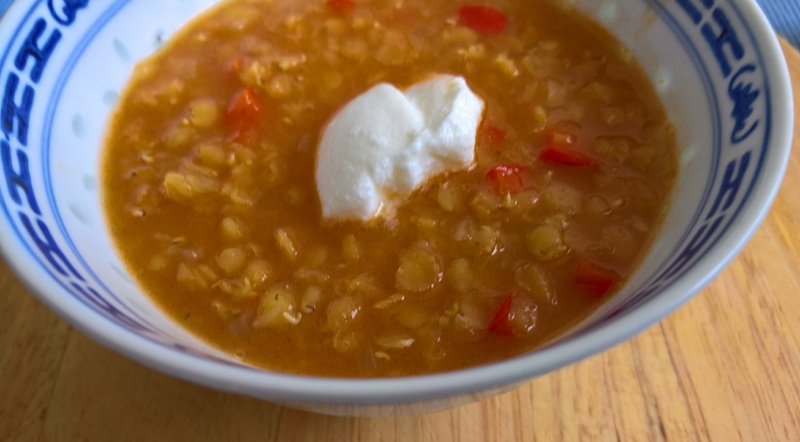 Red lentil soup with peppers, light cuisine; as well as vegetarian with vegan option! as well as vegetarian with option vegan! Here is a recipe light which also satisfies lovers of vegetarian cuisine (and, leaving out a final decoration, even vegan). A nice soup of lentils to serve hot and in a bowl to warm up these winter evenings! (I often use them to enrich the minestrone). For the rest we need a pot, a knife and a cutting board, and in half an hour the soup will be on the table. And now, starting as always from the ingredients, let's start cooking! Peel the onion and cut into small cubes, clean and slice the onion, peel and squeeze the garlic. Clean the pepper and cut it into squares of a couple of centimeters on each side. Keep, for the moment, aside, bell pepper and spring onion (they will be added towards the end, separated). Put a pot on the stove, pour in the oil and as soon as it is heated add onion and garlic. mix over low heat and just start to dry, add salt. Season for a couple of minutes with the tomato paste and then add the stock; turn up the heat and bring to a boil. Pour the lentils, lower the heat and cook for a couple of minutes. Add the pepper to the soup and cook for a few minutes (five or six maximum will suffice: these lentils tend to get rid quickly enough and do not have to cook too much!). Complete with the sliced ​​onion, add the paprika and chili pepper and, if necessary, add salt. Serve in a bowl decorating with sesame seeds and with a spoonful of Greek yogurt. If we do not have vegetable broth ready at home (maybe in the freezer), even the granular vegetable broth will suffice. La vegan version of this dish does not provide the addition of yogurt in the bowl (unless you want to use that of soy ...); for the rest it is identical. You can increase the doses, if desired, to have it ready in the fridge, to be heated, even the day after. Forgive the scarcity of photos, they have not come of acceptable.